There are few things that are more annoying than a leaking dry bag, so it's super important you spend some time considering the different brands and models on the market. As you might know, the quality of the many dry bag brands aren't all the same. The quality varies a lot from brand to brand - and not all brands can handle being used again and again! Besides the quality issue, you also need to think a bit about what size dry bag you need. It must be big enough for all your stuff, but at the same time it should be so big that it's difficult to carry. Having checked thousands of dry bag reviews, we can say that the Shacke Pak is the best choice for most people. The Shacke Pak got a rating of 4.50 out of 5, while the average rating in the list below is just 4.32. This is the best reviewed dry bag. We have checked 74,927 dry bag reviews, so we can show you the weighted average rating of all the bags. If the Shacke Pak isn't your style, you might also consider the Sea to Summit Big River. The Big River is a close runner-up with a rating of 4.41 out of 5, but it's often more expensive than the Pak. The second-best reviewed dry bag. Finally, you might consider the NRS Outfitter. The Outfitter is the third-best rated dry bag with a rating of 4.40, but it's usually more expensive than both the Pak and the Big River. The third-best reviewed dry bag. Below is the list of all top 26 best dry bags. Great if none of the three bags above are your style. PS: We have checked 74,927 reviews to make this top 26 list! If you are an adventurer, explorer, or avid water sportsperson then a typical bag will simply not do for you. What you need is a dry bag that is completely impervious to water and can even be submerged. As you can imagine, this type of specialty bags isn't easy to choose. Is a Dry Bag Right for You? So, first things first – do you actually need a dry bag? It is important to understand precisely what a dry bag is. This type of carrier is not just water resistant or waterproof, it is completely impervious to water. This means that even when it is submerged, it will not let water in. Due to the properties offered by the dry bag, it is best suited to people who are divers, go on boating trips in vessels that are close to the water (kayaks, for instance) or will be trekking through water. Basically, if you anticipate that your bag is going to be splashed or fall into the water at any time during a trip, then you need a dry bag. You will mostly find dry bags that are made from one of two materials – nylon or vinyl. These are specialized versions of the material, however, instead of the ones that can simply be bought in stores. It is important to note that just because bags are made of vinyl or nylon doesn’t mean that they are dry bags or even waterproof. Vinyl is typically used to create the smaller dry bags. The main benefit of bags that are made from this type of material is that it is strong and able to carry heavier objects in it. Vinyl dry bags also tend to be easier to patch up, if they happen to tear. It is normal to find larger or higher-end dry bags that are made from nylon. Now, on its own, nylon isn’t completely waterproof. It must be treated with a laminate covering to ensure that it doesn’t let any water through, even when it is kept in water. One of the most reliable coatings is silicone although you can also find bags that have been coated with plastics such as polyurethane. When your bag continues to rub against another surface, particularly an abrasive one, it has a tendency to wear away in certain spots. This is why it is important to get a dry bag that is able to withstand this type of friction. Thus, it needs to avoid pilling and any changes to the texture of the surface of the material. Here, vinyl tends to be a good candidate as it is highly abrasion resistant. A durable material will be able to prevent your dry bag from tearing quite easily. However, if there is a chance that a tear can appear, you will require a fabric that will stop the bag from ripping apart any further. If you will be in an environment where your dry bag can catch on anything, a backpack made of ripstop nylon can be helpful. This will prevent any rips that do form from spreading. The sun can be quite damaging to dry bags due to the constant exposure to UV rays. The rays can cause the materials to fade and wear away with time. For people who spend a lot of time out in the sun, it can be helpful to find dry bags that are UV resistant. In these instances, you should focus on dry bags made from TPU laminated nylon. Barrel Bags/Dry Sack: the most common design is the dry sack which is also known as a barrel bag. They are cylindrical bags that are well known for their ability to be completely impervious to water for long periods of time. They are particularly great for divers or for other water activities. Mobile Phone/ Wallet Dry Bags: as you can probably tell from the name, this type of dry bags are specifically meant to keep your mobile phone or wallet dry, even when you are submerged. These bags are often quite small and come with lanyards that can be worn around your neck. Kayak Dry Bags: while most dry bags are meant to be taken aboard kayaks, a kayaking dry bag is meant to fit in this small vessel. It has a tapered end so that it can be stored in the nose of a kayak. These bags are often built to float as well, should they fall into the water. Rucksack Dry Bags: the most notable thing about this type of dry bag is that it resembles the backpacks that you carry on a regular basis. This is largely due to the carrying straps that are fitted on the back of the bag. It is essentially a waterproof backpack. Duffel Dry Bags: the main difference between a rucksack dry bag and a duffel dry bag is the handles. A duffel bag is meant to be held by the straps and thrown over your shoulder. The benefit of these bags is that it is easier to get to your belongings inside the bag. 3 – 5 liters: this is a good size if you are planning on going kayaking for a few hours and only want to take some food and electronics with you. It may be possible to fit in a first aid kit into these bags as well. 10 – 15 liters: bags between these sizes may be able to carry enough of supplies to last you a whole day out on the water. You may even be able to take a change of clothes with you as well. 20 – 30 liters: these bags can contain food, supplies, clothing, and a sleeping bag. They are well-suited for overnight stays. 30 – 60 liters: if you are going to be spending a weekend or more in an area where your belongings may get soaked, bags of these sizes will work fine. 70+ liters: the main purpose of these bags is to allow you enough space to carry certain types of equipment. They also work well for longer trips too. One of the most vulnerable points on a waterproof bag is its seams. Since most backpacks have stitched seams, this provides a place for the water to seep in. This is why, with time, even the strongest seams (complete with double stitching) will let the water in. If you want a dry bag that is completely waterproof, you will need to look one that has unique seams. This means that you will need to rely on either heat taped seams or heat welded seams. Here, the seams have a different coating applied to the seams inside the bag. Then, either heat or pressure is applied to this area until the materials bond together. This way, there are no gaps for the water to enter through. With this process, the same material is bonded together. Here too, heat is applied to the fabric so that it melts and solidifies together, creating an impermeable barrier against water. While welding tends to be the most reliable form of creating waterproof seams, bags with this type of seam can be quite pricey. Plastic zipper closures: these closures resemble the interlocking features of a zip-lock or freezer bag. These closures are mostly found on bags that are attempting to seal up mobile phones and wallets. 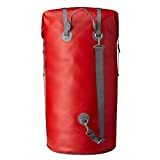 Roll-down tops: the dry bags with roll down tops are ones that can be folded down several times and then secured with either buckles or Velcro. These tend to be one of the more widespread closures due to its effectiveness at keeping out water. Drawstring closures: as you can imagine, by themselves drawstring closures don’t offer a lot of protection against the water. This is why they are usually used alongside Velcro and buckle features as well. How Waterproof is Your Dry Bag? It is important to understand that just because a carrier is referred to as a waterproof dry bag, doesn’t mean that it is actually going to keep the water away from belongings forever. In practice, most dry bags keep the water out when submerged for a considerable period of time. In some cases, though, these bags will let the water in after this. A true dry bag, however, shouldn’t let the water in at all. To determine how well a bag is capable of preventing moisture from seeping in, you can run an easy test. You should turn your dry bag inside out and then fill it up with water. Then, after a period of time, check to see if any of the water has leaked out. If there has been no leakage, you can be certain that you have a good quality bag on your hands. This is all the help that you will need to find a dry bag that fits all of your needs and will continue to be the perfect accompaniment to all of your adventures. Classic dry bags and models that haven't yet got enough reviews to be ranked. List ID 33. Images from Amazon Product Advertising API and shop datafeeds.